← Where My Peeps At? Confesh: I JUST started watching Breaking Bad this weekend. I know, shocking, since I am probably one of the most cutting edge people you know, that I am jumping in FIVE years after a show premiered to finally take it all in. Toto, I have a feeling Bryan Cranston is not Malcolm’s dad anymore. The elitist snob in me is so embarrassed to admit this. Liz Simons doesn’t jump on the bandwagon, she frigging drives them and picks up people along the way. Toot toot. For example, I watched Mad Men before Jon Hamm’s package was even a thing, and I admit I was so bored by it (the show, not the package) that I gave it up after one season. To be historically accurate–I actually DID watch the first two episodes of Breaking Bad when they premiered on AMC (American Movie Classics, y’all!) in January 2008. I was living in Brooklyn with two boys (God, you can practically TASTE the hipness oozing off of me) and I DVR’ed it and watched it in my bedroom. But then I moved to another apartment where I didn’t have control of the DVR, and then I fell so far behind that was the end of that. By the time I moved into my own apartment, the first season was already over and I said F it, plenty of other shows to watch. Okay, so now let’s get back to the present. I decided to do something I rarely ever do–in fact it is unprecedented in the life of Liz Simons–I started to watch Breaking Bad from the every beginning so I could catch up in time for the series finale which will be airing this summer. Now, I’m too cheap to do Netflix so I requested the DVDs from the library. It took me 3 months, but I finally got Season 1 last week. Thank God this first season was only 7 eps, because even I have trouble watching 13 episodes at a time (you can keep DVDs for a week, and then it’s $3/day in fines!). And damn, is the show good. I get it. 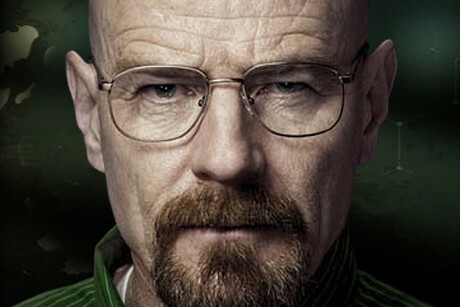 I like Walter White, even though he is kind of evil. And Jesse Pinkman, portrayed by former model Aaron Paul, looks like he could appear on an episode of Intervention, so the casting directors clearly did their work. I’m enjoying it but damn but life is going to be all about meth the next few months. Sorry folks!